After complaining of knee soreness today before the New York Knicks' game against against the Jazz, forward Amar'e Stoudemire underwent an MRI. 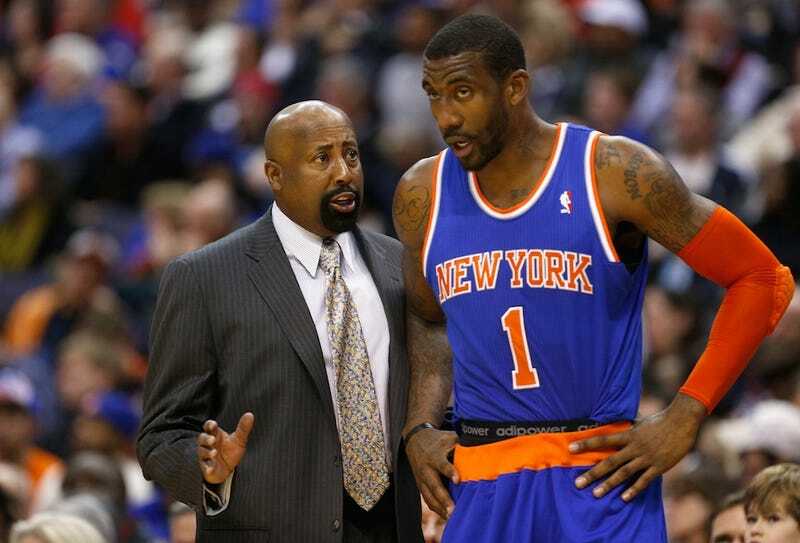 The result showed that Stoudemire's right knee needed a debridement, or surgery to removed dead and damaged tissue. He'll miss six weeks. It's a blow for the player, who is a shadow of his younger self after fighting knee injuries for years. His history of ailments was so concerning that his five-year, $100 million contract with the Knicks is uninsured. He missed the first two months of the season, but has been playing well as reserve for his team this season. Once a cornerstone of the organization, Stoudemire has averaged almost 16 points off the bench over the last month. It's also a blow for the Knicks. In the short term, New York is going to have to play at least tonight's game without Stoudemire and their best player Carmelo Anthony, who's also sitting for the third straight game with fluid in his knee. New York, once battling with the Miami Heat for the first seed in the Eastern Conference, has fallen behind the pace and now is in third behind the Indiana Pacers. The fourth seed, Brooklyn Nets, are only 2.5 games back. Stoudemire's expected to take the entire six weeks to heal, which means he wouldn't be back on the court until the postseason. And then he'll be in the same predicament as the San Antonio Spurs' All-Star point guard Tony Parker in that he'll be trying to play himself back into shape during the first round of the playoffs. As of now, Anthony starts at power forward, and for the most part, Anthony seems to do better in that role than when Stoudemire is inserted into the lineup, moving Anthony to the small forward. But Stoudemire's absence will mean more minutes for guys like Steve Novak, Chris Copeland and Kenyon Martin, players less effective as scorers and rebounders. Knicks head coach Mike Woodson told reporters today, "It's a major loss to what we're trying to do," but also added, "We can't sit and sulk."